In the midst of the storm they saw a human figure walking toward them. They became terrified; people don’t walk on water, let alone during a violent storm. 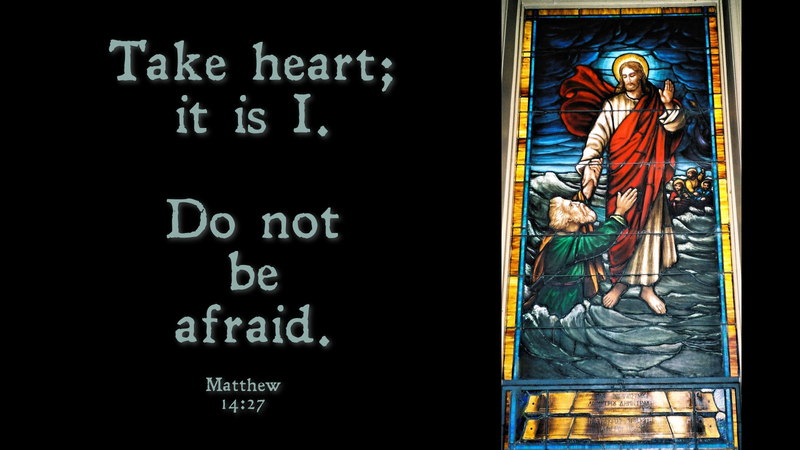 Yet, Jesus says, “Don’t be afraid, it is I.” Hearing his voice, Peter begs his Lord, “Command me to come out on the water.” There comes a point when fear must give way to faith, and faith leads us to trust and belief. Prayer: Lord God, Rescue me from the things that go “bump” in my life. Help me to take heart and know you are with me always. In Jesus’ name I pray. Amen. This entry was posted in Faith and tagged Adversity, Being afraid, Christianity, Discipleship, Faith, Fear, Following Jesus, Jesus, Jesus Christ, Spirituality, Storms, Walk on water. Bookmark the permalink.